A NEW BREED OF SCREED! The MOTOSCREED™ Vibratory Beam Screed uses dual, adjustable-force, vibratory motors, uniquely mounted to an aluminum tube-beam, to generate rectilinear motion which self-propels the Screed along the rails of a precast concrete form as it knocks-down and strikes off the concrete surface, while simultaneously consolidating the concrete with a downward centrifugal force of up to 1320-Lbf at 3600 vibrations-per-minute. 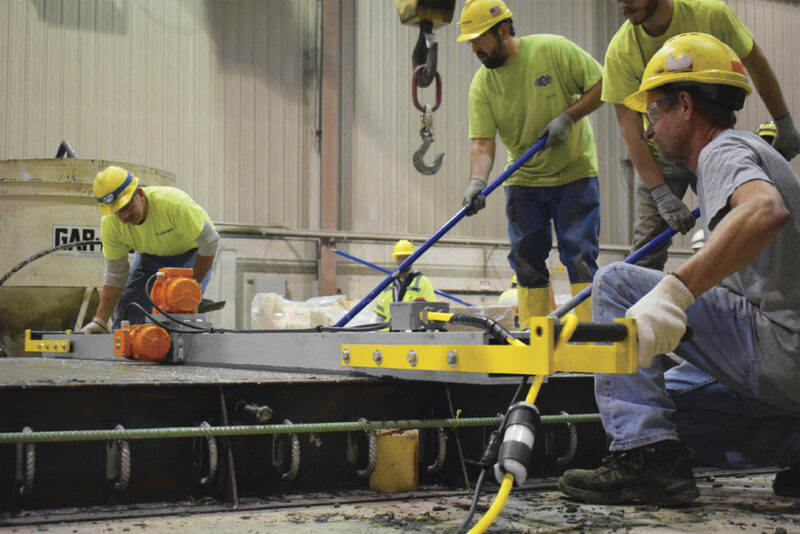 The MOTOSCREED will quickly – and quietly (≤ 73dBA) – spread, level, consolidate and surface-finish conventional, high-flow and self-compacting concrete to a depth of 12″ to 18″. 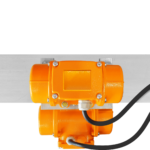 The MOTOSCREED uses the plant’s 115VAC power to run the rigidly-mounted, heavy-duty, speed and force synchronized vibratory motors. 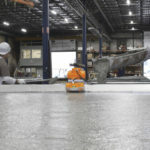 The Screed is activated using an ON/OFF switch in the vibration-resistant control box mounted to the left or right end of the 6ʹL to 18ʹL x 6″W Beam. Because the MOTOSCREED is self-propelled, Operators can control the Screed’s slide along the Form’s rails by lightly gripping the vibration-dampened handles to easily guide the Screed without pulling, pushing, or suffering the hand/arm musculoskeletal disorders associated with prolonged use of hand-held vibrating equipment. 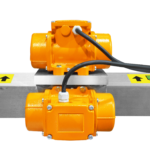 Although the dual 115VAC Vibratory Motors operate quietly (less than 70dBa), the synchronized Vibrators operate powerfully and efficiently, producing the amplitude, frequency and centrifugal force required for ideal consolidation and finishing. The Vibrators are activated with a soft-touch ON/OFF switch built into the vibration-isolated switch box. The switch box can be mounted to either end of the Screed so as to minimize electrical cord clutter. • SELF-PROPELLED – Traditional screeds require considerable-effort to Push/Pull the unit down the Form. The Motoscreed greatly reduces that effort, allowing Operators to simply guide the Screed down the Form. • ADJUSTABLE FORCE VIBRATORS – Consistent spreading, leveling, surface-finishing, and consolidating concrete is determined by matching the centrifugal force output of the Screed’s Vibrators with the concrete’s variables (type, mix, slump, etc.). To account for these variables the force settings of the MOTOSCREED motors are adjustable to10 CF output increments. • UNIFORM VIBRATION – The Vibrators unique mount design provides uniform linear force vibration over the entire length of the Screed to enable more complete and faster leveling and consolidation than traditional vibratory methods. The MOTOSCREED is ideal for use on Flat Slabs, Wall Panels, Architectural Panels, Isolated Panels, SUPERIOR Wall Panels, Double T’s, Bridge Decks, Spandrel Beams, NEXT Beams,Preparation for stamped panels and singular products!